When you’ve considered the implications of bringing home a second dog – and decided that you still think it’s a good idea – what is the best way to introduce your new dog to your home? How do you best ensure that your current dog will welcome the newbie with open…er, paws? And not open jaws? 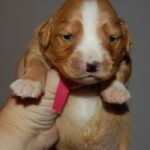 I’m going to give you a few approaches to expanding your family with a new dog or puppy to increase your chances of doing it successfully. Overall, what you should consider is: How do I allow my dogs to get to know each other with the least amount of stress? And how do I ensure that whatever stress arises is dealt with quickly, in a way that feels good to my dogs? With that in mind, here are a few approaches that are available to you. Before you consider any of these, just make sure that you’ve read my article on how to introduce your dog to another dog in 10 easy steps. As you might imagine, those steps will come in handy, especially for the initial introduction that you make with your dogs. OK – now for the heart of the matter. How do you best ensure the happy co-existence of your pups, old and new? This method sounds technical and stressful – and that’s because it is. Or, at least, has the potential to be. In HVCIM (for short) you would manage every interaction between the two dogs, for fear that they might not get along so well. You would never allow them free time with each other, especially indoors, and would ensure that you do everything with each of them separately. Feed, train, play, etc. Now, if you were adopting a dog that had known aggression issues (or if your dog has known aggression issues), then maybe you’d want to err on the side of hyper-vigilance. You want to be sure that your dogs are going to be fine together before you give them free reign – and even then you’d want to avoid charged activities that could potentially lead to violence. Walks together will be great. Feeding together – probably not so much. Turned off by the idea of having to manage every interaction between your dogs (or maybe simply wondering what the point of having more than one dog is if you can’t just let them be a family), then you might decide to follow the complete laissez-faire approach. If you subscribe to this approach, you basically have decided to not worry about it. You bring the new dog home (please at least follow the steps to introduce them), and then just let whatever happens…happen. If you’re lucky – no problems. If you’re less fortunate, the new dog in the household creates new energy in the household, which in turn creates problems for you, and for your family, and for your current dog. Then you call me to help you figure out how to help your dogs get along with each other. And while I’m happy to help, why not just proceed on to the “middle way”, which I think you’ll find to be much more satisfying and successful. End of conversation. The thing is, there are aspects of both of the previously described approaches that make sense. Hyper-vigilance ensures that you’re aware of the potential for situations to get too energized, or stressful, and for negative interactions to occur. Complete Laissez-faire allows you to relax a bit, to trust things to work out the way that they’re supposed to, and recognizes that not all situations are going to be problematic. You can bring both of these approaches together in the Middle Way. Your goal is to keep things relatively stress-free for you and your dogs. When thinking about potential situations, think about how “energized” they are. And then ask yourself if there’s a way for you to manage that energy – meaning can you give each of your dogs a way to release that energy, so they avoid getting stressed? And so they avoid taking it out on (or with) each other? Or conversely, if the situation is low-key, then you probably don’t need to be concerned. In general, it’s helpful for you to remember the difference between how dog’s experience emotional intensity in an indoor environment versus an outdoor environment. What that means is that indoors, you’ll probably want to err on the side of Hyper-vigilance in situations that produce lots of energy – like, for instance, meal-time. And in situations that are low-key (like everyone hanging out reading in the living room), you can just relax about it. If your dogs get stirred up and start to wrestle, then it’s probably a good idea to bring them outside for a play session – rather than letting things escalate indoors. Of course the way that you do that can be completely low-key and stress-free – don’t get all freaked out about it! To the extent that it’s possible, all of your indoor interactions should focus on keeping things relaxed for each of your dogs. Even downtime in their separate crates can be beneficial for maintaining a chilled-out vibe in your home. Outdoors your dogs have more emotional flexibility, so you can experiment a bit to see how they interact outside the home. However, the best strategy for managing outdoor time is to always start out with a walk together. If you can have one human for each dog, so much the better. The walk allows you to give your dogs time to feel themselves united by a common purpose (the walk), and since their attention and energy is directed at their experience of the environment, it also gives them a chance to calibrate their emotional interactions with each other. Contrast this with taking your dogs outside and having them just focus on each other, or on competing for toys/attention – which might not be a sure recipe for disaster, but will surely increase your chances of creating strife amongst the canines. After your walk, you can bring the dogs to an open space where they can play more freely. You’ll find that the quality of their interactions is much less intense, and much more playful. In order for play to occur, there has to be some energy flowing between them – but too much intensity is more likely to lead to fights than wrestling and chasing each other. As a safety precaution, you should have one of the dogs attached to a long leash - so in case altercations break out you can separate them more easily (if both dogs are on long leashes you run the risk of getting them entangled, so I'd go with a long leash and a short leash, or a long leash and a simple flat collar on dog #2). Watch them to see if they’re flipping polarities easily – switching from chasing to being chased (predator to prey) and vice versa. If the dogs appear to be “stuck,” or if the energy is starting to get a little heated, then that’s a good time to separate them. You can walk some more (to get the energy flowing), or separately play tug-of-war (or do pushing) with them as individuals, to help them release any of the stress that was building up between them. Make sure you trust your gut on when it’s time to split the dogs up and work with them individually to release energy and stress. I can’t tell you how many times I’ve talked to a client about a dog fight only to have them tell me something like “I knew it was going to happen, but I just let things keep going.” Trust yourself. Always better to have too little play between the dogs (and more interaction between you and each dog as individuals) than to have there be too much and have a fight erupt. Overall the structure is simple. Spend time with each of your dogs separately. Spend time with them together. It’s helpful to have one human per dog, so if they need to be split apart you can do that easily. Remember that play time between the dogs can raise their energy level and stress (even if it’s fun) – so make sure you allow time for your dogs to release stress with YOU each day (the aforementioned pushing and tug are good places to start). Give your dogs plenty of downtime, and keep the indoor environment as relaxing as possible. Pay attention to what’s happening between them, and if you feel like there’s too much friction (or that your dogs aren’t orienting enough around you), then feel free to use crates as a vehicle for keeping your dogs chilled out and safe – apart from each other. Then, when they come out of the crate, let that be time (at least initially) spent with you, outside, pushing, tugging, connecting. 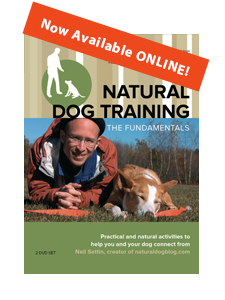 Of course there are also lots of activities on my instructional DVD set to help you build and strengthen your connection with each of your dogs. You might recall that my dog Nola used to be a terribly aggressive dog. Even back then, whenever I had a roommate with a dog, or a girlfriend with a dog, or (you get the picture), she always seemed to be able to work it out with them and get along well. 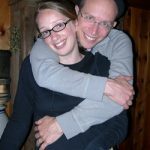 I think that this is because overall, even when I didn’t entirely “know what I was doing,” I was still paying attention to my intuition and a common sense approach to the best way to grow one’s family without too much friction. Of course it does happen that dogs don’t always get along, but in general, if you stay relaxed, reasonably aware of what’s going on, and take preventative measures – along with working in exercises to keep your dogs focused on you instead of each other – then it’ll work out just fine. And if you’re really paying attention to helping your dogs release stress with you, then you can be reasonably sure that they won’t take it out on each other. Ultimately your dogs want what you want: a happy, stress-free family.